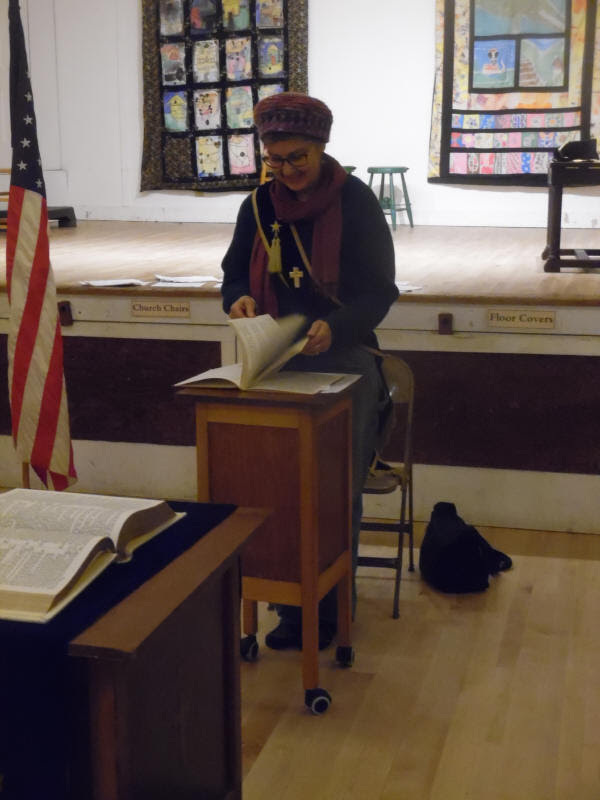 Grange meetings–not just for April Fools? At our next meeting on April 6th, we’ll be having a couple of guests from a Massachusetts Grange, located in Westport, in the southeast corner of the state. Barbara and Ed are visiting family in the Champlain Islands, and will stop off to see our Grange, attend our meeting, and hear how we are keeping our Grange active and successful. They will also hear how we are continuing to struggle to do just that! 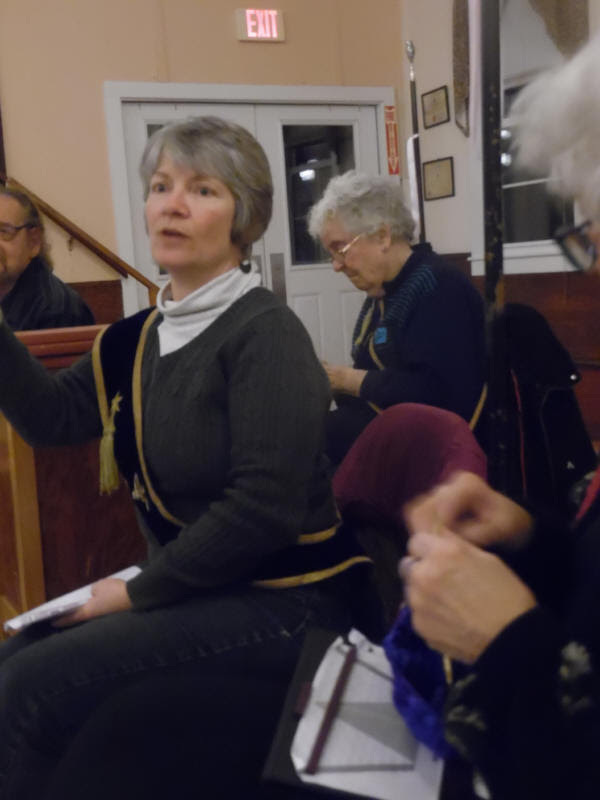 Our main topic at the meeting will be a continuation of our March discussions of how to get more folks involved, including ideas for possibly restructuring our meetings. We’d enjoy hearing the ideas of anyone who wants to talk to us–about why you do come to meetings, or why you don’t. Or why you do like organizing projects at the Grange, and how you can help us find more people to do that. We’d love to talk to you at the meeting…and of course have you stay for the Community Potluck afterward. 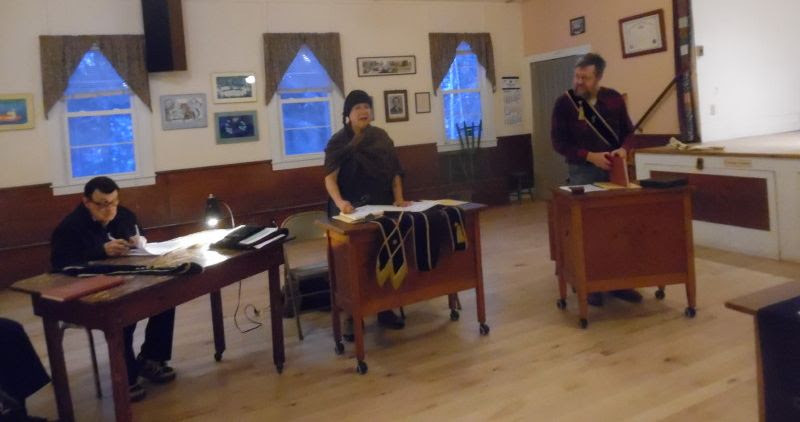 Here are a few pictures from a meeting earlier this year, showing a few of us wearing our sashes, talking about Grange business, getting ready to play for one of the songs is always an enjoyable part of the meeting. 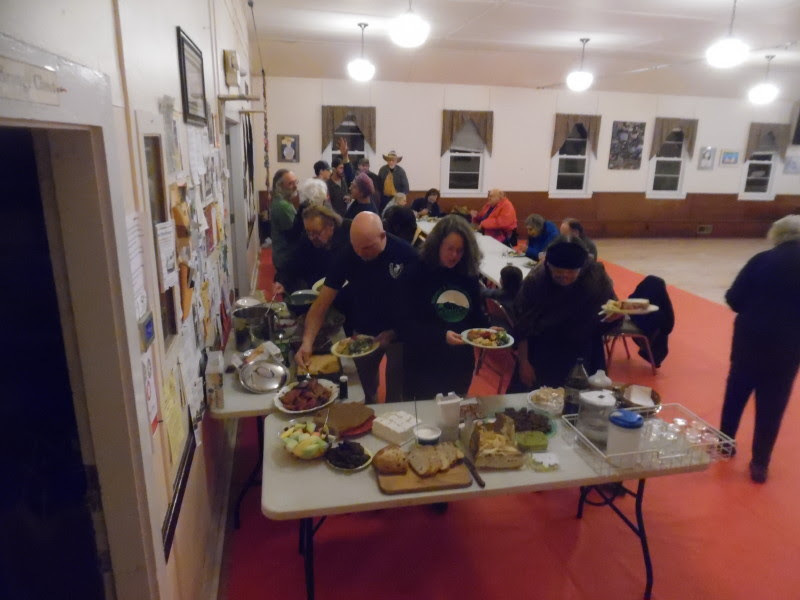 Join us for potluck dinner this Saturday at 6:00, following the Grange meeting. We get a good crowd, and lots of tasty dishes that range from meat to vegetarian to….dessertarian! The more people we have, the more choices we have. We know you are going to eat something for dinner on Saturday, so why not join us? 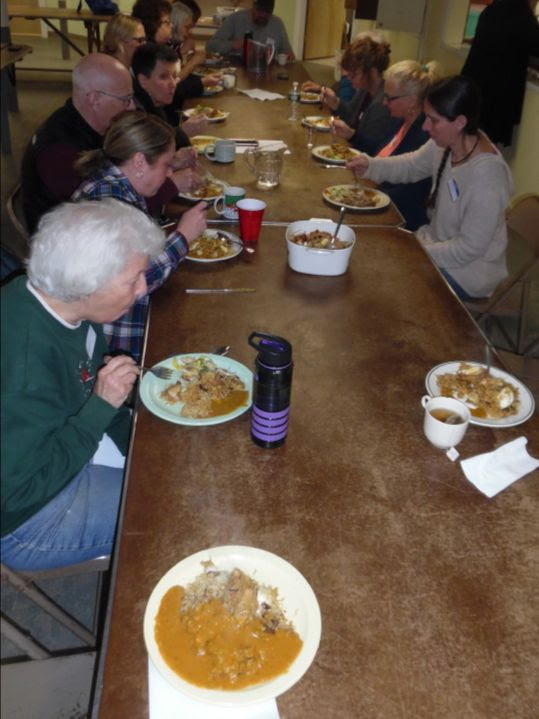 Donations have included chicken casseroles, roasted root vegetables, breads, cole slaw, chips, pizza, spreads, cookies, crown roast, green salads, pies, sodas, cider, milk, brownies, baked beans, macaroni, dal, fruit–we never know. Surprise us with your favorite dish to share–we can guarantee a number of empty stomachs that will welcome it! 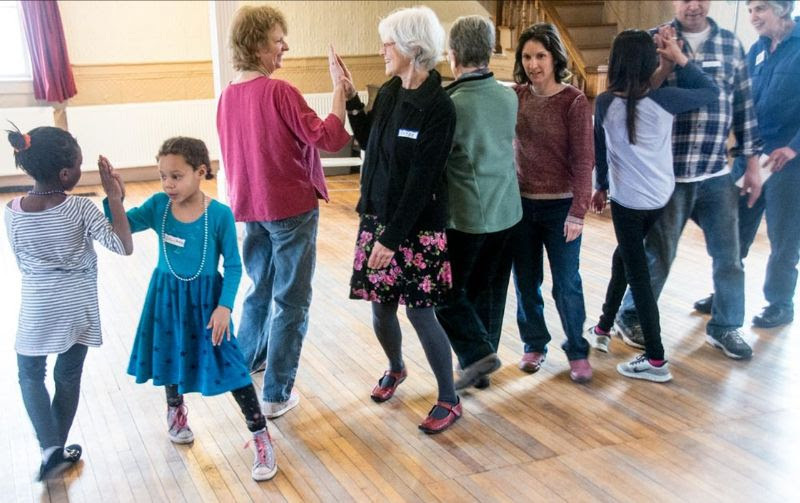 We invite everyone to join us–whether you come to the Grange meeting or not, and whether you plan to stay for the contra dance that happens later in the evening or not, we will be happy to share our food and our socializing. Chicken Biryani, Dhansakh Dal and Kachumber The pictures above show some the dishes that made our mouths water on Sunday, March 24th. 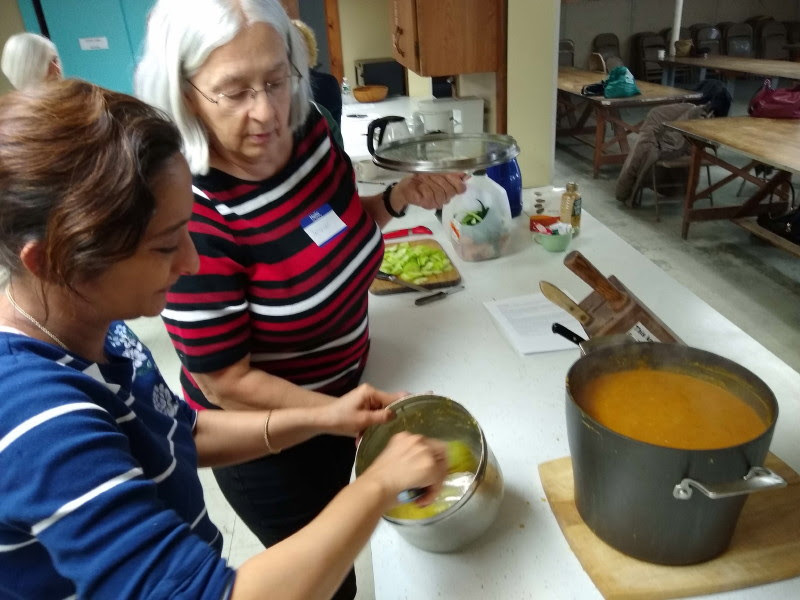 Grange member Delna Boyce taught 15 of us how she cooks her tasty combination of recipes, and explained the ingredients for all of these dishes: Chicken Biryani, Dhansakh Dal and Kachumber. 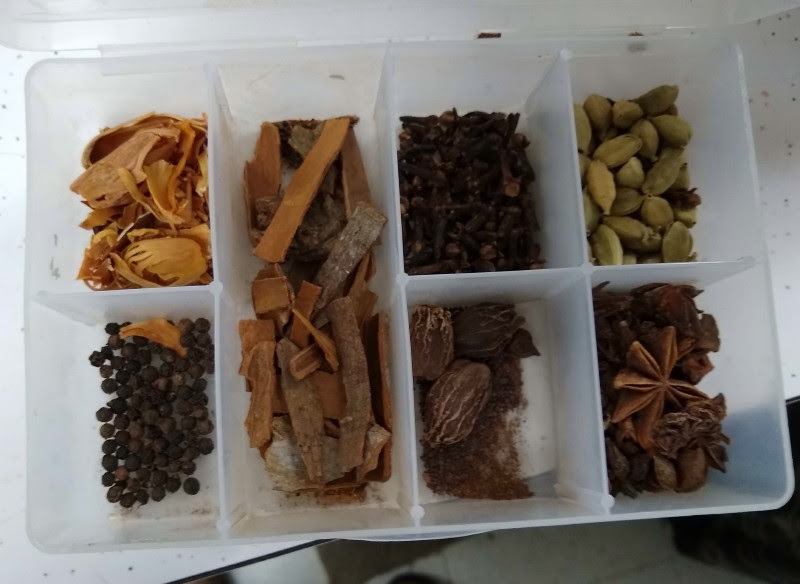 The top picture shows just a sampling of the whole spices she uses–Star Anise, Cinnamon sticks, a few kinds of Cardamom seeds, and a couple of others I didn’t write down! She also brought pre-mixed masalas–spice blends she brought back from India on a recent trip. The combination of the spices with onion gravy, green chilies, garlic, yogurt, tomato, plus saffron, cumin, coriander, some lime juice, basmati rice–it all added up to very tasty main dish of Chicken Biryani. It was served with sliced hard-boiled eggs decorating the top. Besides this, she made a dal, or legume dish. This was made from Toor Dal (pigeon peas), Moong Dal, chopped up Hubbard squash, zucchini and eggplant, tomatoes, onions, garlic, ginger, coriander, cumin and Dhansakh masala powder. Some turmeric and lime juice added another set of spicy tastes to the plates. You can see it in the large black pot in the top right photo. The third dish was a Kachumber salad–sliced onions, cucumbers, tomatoes, radishes and mango, with coriander leaves, seasoned with salt and more lime juice. 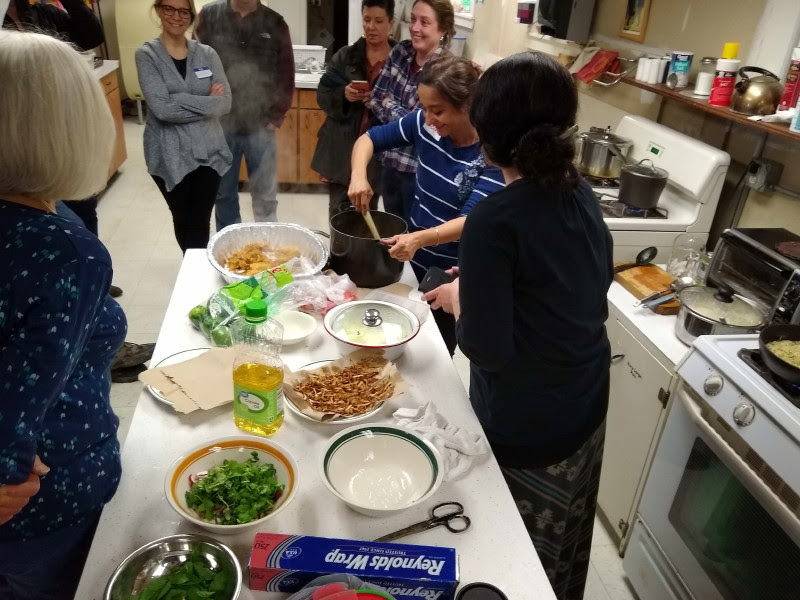 Delna explained some of the steps as she did them, and then urged us to ask questions while the Biryani finished cooking. She explained the wide variety of spices, telling us which ones we might be able to get at the Indian food store on Williston Road, and which she had to bring back from India. 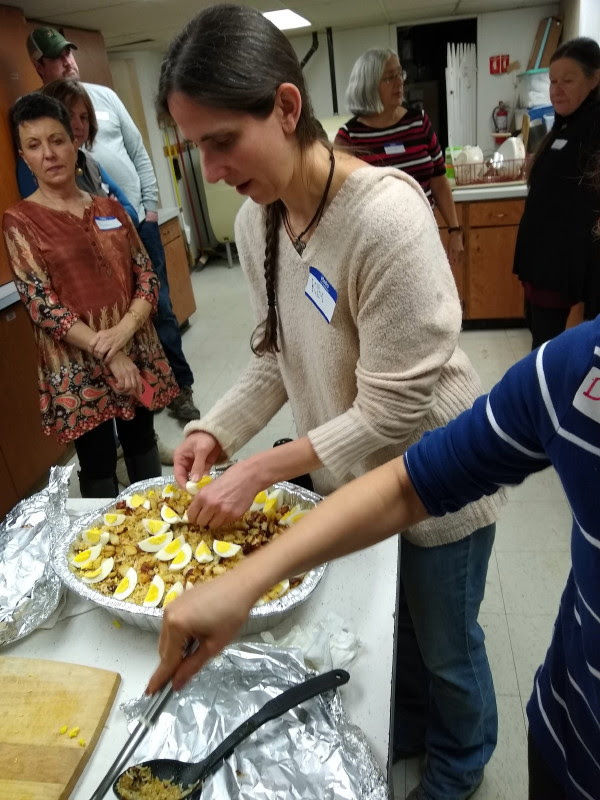 She also told us what we can substitute, and how she combines ingredients from more standard recipes to get the more complex flavors she likes. Delna is not a doctrinaire “my way or the highway” teacher! Despite our original plan to aim for 12 class members, we ended up with 15–which shows how popular these sorts of classes are. We ask for a $20 donation to cover the costs of ingredients, heating the Hall etc., which is pretty cheap for a great bill of fare like this, including a dinner at the end, and some leftover dal for most if not all of us! We can do more workshops like this–if we get the right combination of willing volunteer teachers and help organizing. Check it out–Saturday, April 13, 9:30-11:00 AM! Kids Trade ‘n’ Play–seeking more good clothes for kids! Erin Barry, who started this monthly clothing & toy exchange, is asking for some donations–read her message below! 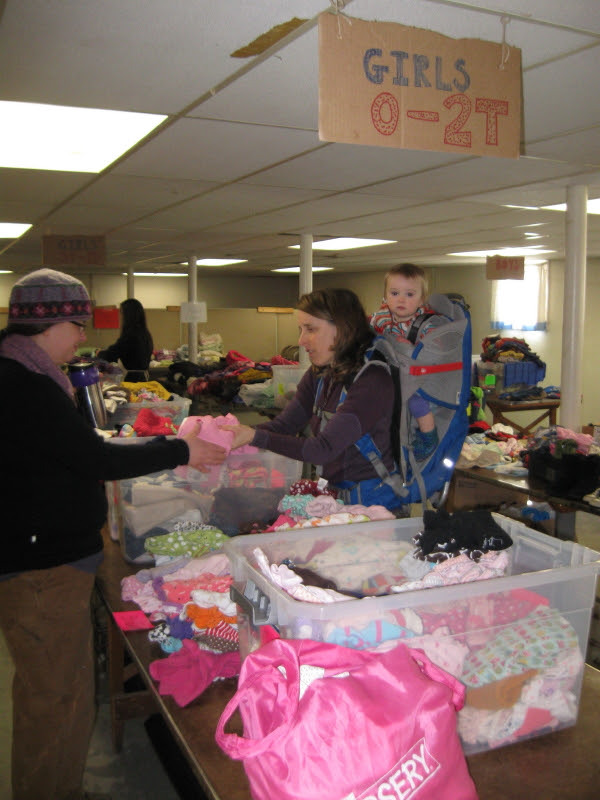 Kids Trade and Play is hoping to bump up our collection of clothing for children sizes newborn to Junior 10. ‘Tis the season for shopping and what better way for parents to get this task done while drinking coffee, eating scones, socializing and only spending $3 per family–and taking home all the clothes you want?! We, the volunteers of the program, are putting a mid-month call out there for donations. We are accepting clean clothes and shoes in great condition. Also coats will be taken at this time too. Thank you for Reducing, Reusing and Recycling! We can do this together. 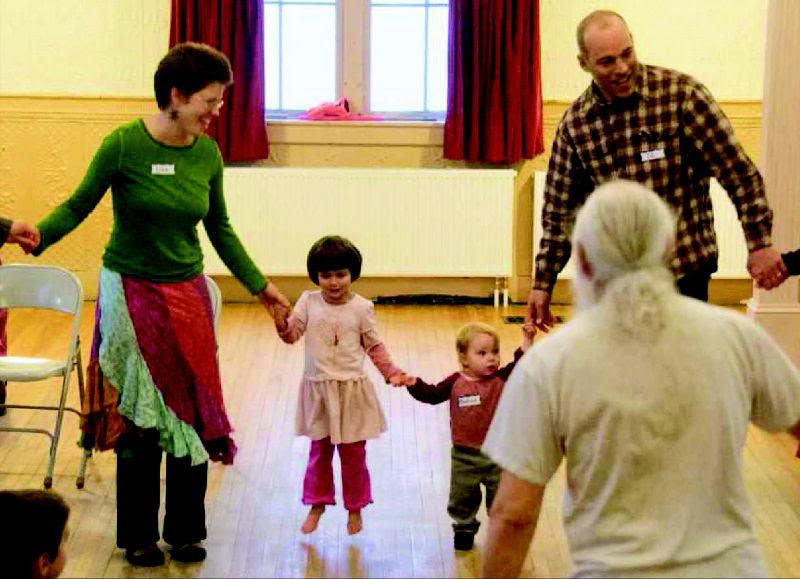 Sunday, April 14, 3:00 to 4:30PM Fun for all–bring or borrow a child, or come by yourself, and enjoy traditional family dances, play party games, songs, all with live music! Calling by Liz Benjamin and Stan Carlson! Free for kids, suggested donation of $5 for adults, but no one will be turned away. Welcoming kids of all ages and jumping abilities. Challenge yourself: can you have this much fun? The sound of one hand clapping… That might sum up the response to the first batch of acoustic panels, which were assembled and hung on the south wall of the Main Hall, opposite the stage. 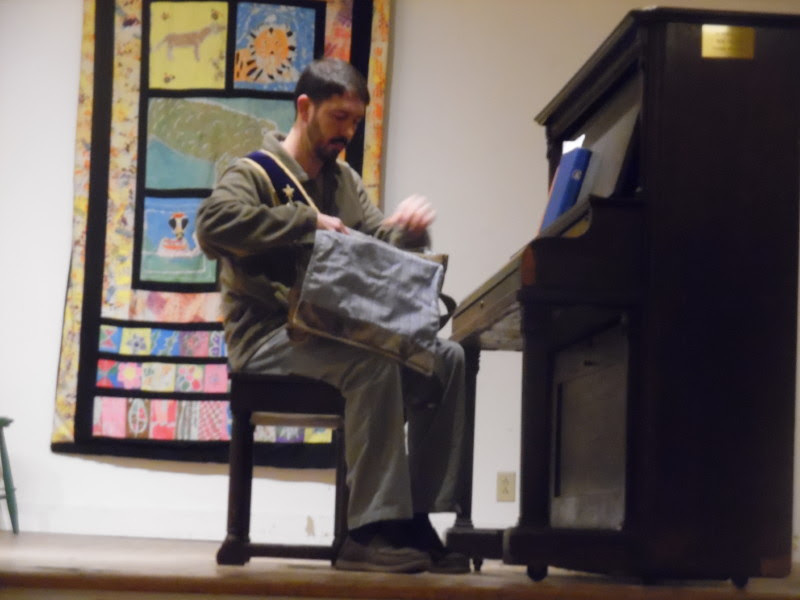 While some of us feel we can detect a reduction in the “reverb” of the Hall, it hasn’t been enough to make a significant difference, judging by the feedback from some users (the Barre-Tones women’s singing group, and sound-guys from the contra dance). More sound absorbency seems to be needed. So–encouraged by the excellent turnout of helpers at our panel-assembly-and-panel-hanging work party, the Friends of the Capital City Grange (FCCGH) is planning another round. This time, we’ll be building panels that will about triple the wall area covered. There will be narrow panels over all the windows in the Hall, and 4′ square panels between the windows. The materials will be paid for out of the generous donations which Grange supporters gave to the FCCGH in the 2018 end-of-year appeal, like the first batch of panels. Materials will be prepped by Kurt Giavara and Tim Swartz, and we’ll announce another assembly party once we have materials ordered–sometime in April. Keep your eyes–and ears–open for the next developments!